"I hoped that school would nurture his sense of wonder, make him smile and laugh each day, fuel his desire to explore the world, and spark his imagination just as our walks and exploration time had done at home." Do we train that wonder out of them? Do we teach to tests, evalutate when we should be helping them make discoveries? Do we provide classrooms where opportunities for curiosity, creativity and exploration are rare? What do we value? These are some of the questions that led Georgia Heard, teacher leader and writer, and Jen McDonough, a primary teacher working with a staff that shared some of those same concerns, to write this powerful book about helping young children read and write nonfiction. Using activities and personal stories from the classromm, they describe a 'landscape of wonder' that can be developed through patience and peristence. Although they are discussing what happens in a grade one classroom, there are many circumstances where their ideas and suggestions can be adapted for all ages. All students need to be infused with the enthusiasm and love of learning demonstrated in these pages. If kids love what they are doing, they do it with concentration and energy and their reading and writing reflects it. Such work leads to our goal for them...lifetime learning. 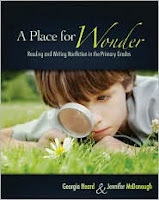 The authors provide many practical and stress-free ways of creating 'wonder centres' and using them to look to the world with our senses intact, with questions on our minds and with meaningful research that makes learning dynamic and energetic. They guide teachers step-by-step through planning a unit with nonfiction as its focus, and include creating a table of contents, writing with a point of view in mind, word choice and chapter development. It all begins with the children...and the results are amazing! I really liked that Jen reflected on the learning as it happened with the students in her classroom. It made the process real for me as a reader; and it made me think deeply about the children there...the real 'wonders' in that 'wonderfull' place. "A wonder school would honor the heart and body, the right brain of awe and wonder...We must educate about awe - awe of our universe, awe of our planet and its eighteen-billion-year story, awe of the creatures with whom we share this planet"